Many times when I mention St. Thomas' "virtue of religion" in conversations, I get winced stares of utter confusion. On the one hand, this makes me excited because I am most fain to share what I have learned from my studies of St. Thomas (my brothers are probably getting pretty bored with my rants on religion); but on the other hand, it makes me a little sad because the virtue of religion is such an important and integral part of living the Christian life. With the help and inspiration of Br. Brad, our videographer, several videos will be put out explaining Aquinas' teaching on the virtue of religion. 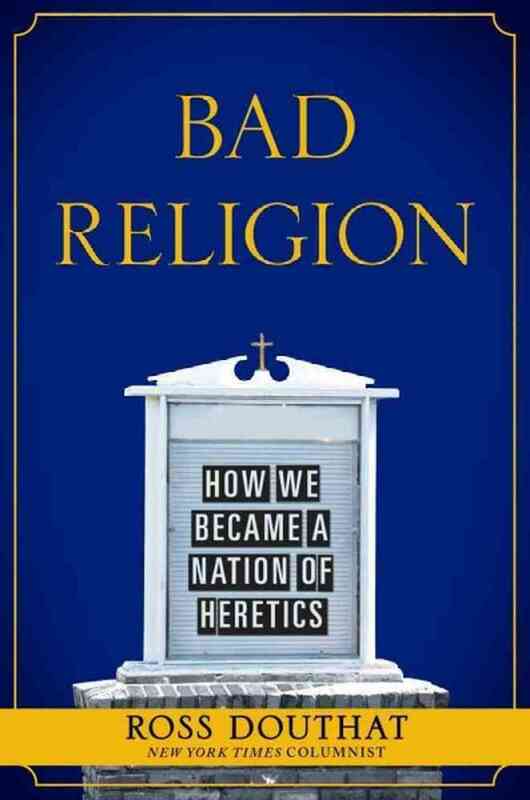 Though Ross Douthat's Bad Religion: How We Became a Nation of Heretics (Simon & Schuster, 2012) was published almost two years ago now, I just got around to reading it over Christmas. It is one of those books I could hardly recommend more to sincere Christians who are trying to sort out the role of Christianity in the public square today. Douthat is an op-ed writer for the New York Times (one of the two token conservatives on staff), whose first two books and multitudinous articles have established him—young as he is—as a prominent cultural critic and observer. Douthat has been praised especially for his balance, which is on rather remarkable display in his most recent book. He sets forth his own positions incisively and with an engaging writing style, while mindful of the weaknesses within the groups he represents; yet is also able to see the strengths and potential good in his opponents' positions. In other words, he betrays a genuinely Catholic sensibility. Every Christian in America today is aware, on some level, of the ideological battles that rage between and within different communions, the various camps often (and unhelpfully) drawing their vocabulary, attitudes, and posture towards the world, from the clunky categories of the American political scene. As a Generation X convert to the Catholic faith myself, I often have to work very hard to figure out how battles that were fought in the 1960s and '70s—over, say, formal or informal liturgy, abandoning or sticking to traditional theological vocabulary, whether clerics should wear distinctively religious attire or not—are still relevant today. Many have noticed that these post-Vatican II battles, or at least the language and set of cultural assumptions within which they emerged, seem even more remote to the generation following mine, the "Millenials." The first great service of Douthat's book is to familiarize someone like myself with the "world" of 1950s American Christianity, then the various historical and social forces that, in the ensuing decades, led to the quite complex and varied situation we have today. This is the burden of the first half of the book. The second half goes on to detail a set of "American heresies" Douthat sees operative in the minds and hearts of most average American Christians today. The first half, though, begins by drawing off political trends, social scientific data, theological movements, and broader cultural features, to paint a picture of what Douthat calls the "Lost World" of the 1950s. It is not a lament for a pristine era—to my mind the author is careful not to fall prey to false idealization, despite what some reviewers have said. Rather he sets forth, for the sake of comparison, a broad array of features that characterized the American Christian scene circa 1960. He points out, for example, that in the 1950s Christianity had a—startling to even utter—strong public presence in the United States that was, on the whole, respected by politicians and intellectuals alike. Having grown up myself in the 1980s in what is known as the "mainline" (as opposed to evangelical) wing of American Protestantism, I was astonished to see that the mainline denominations—Episcopalian, Presbyterian, Lutheran, Methodist, etc.—actually experienced growth in the post-WWII years. (Since the 1960s they have experienced an almost universal decline in numbers.) The public prominence of such figures as Fulton Sheen, Reinhold Niebuhr, Billy Graham, Dorothy Day, and Martin Luther King, Jr., bore witness to a Christianity that was, though confessionally varied, intellectually respectable, politically engaged, and strong enough to wield significant cultural influence. Thinkers, writers, and scholars forged within a Christian worldview abounded, able both to engage and win respect from the highest levels of academia, as well as assert a public presence that shaped Christian thinking and consciousness: W.H. Auden, T.S. Eliot, C.S. Lewis, and Flannery O'Connor, from the literary side; Christopher Dawson and Arnold Toynbee as historians; John Courtney Murray and Jacques Maritain as theological-philosophical minds who summoned their impressive abilities to political influence. And then came the '60s. Douthat suggests five factors that, taken together, contributed to the deep fractures American Christianity experienced in the ensuing decades: (1) political polarization, and an increasing politicization of religion; (2) the sexual revolution; (3) globalization; (4) the religious consequences of increased wealth; and (5) class. Politically, the Vietnam War and the Civil Rights movement sparked generational conflicts between an older Eisenhower-era generation in favor of change, but the slow and gradual type; and the younger leftward-leaning generation who demanded more confrontational "shake things up" tactics. Religion within this atmoshpere became increasingly wedded to political agendas, a trend Douthat illuminates by contrasting two pairs of leaders, one from the "old" and the other from the "new" order. In the 1950s and '60s, Billy Graham and Martin Luther King, Jr., though coming out of politically opposite constituencies, managed to transcend their political affiliations, and remain effective Christian witnesses. Graham grew to respect and eventually support King's work; and King would have been, as much as Graham, recognized as a Christian clergyman of public import. By the 1980s, on the other hand, an unseemly picture emerges: Pat Robertson, in a manner the heir of Graham's largely white, conservative constituency, intentionally allying himself with the Republican Party vis-à-vis the Christian Coalition; and Jesse Jackson, on the left, summoning his religious clout to the full support of the Democratic Party platform. Each makes a bid for the 1988 Presidential election, a spectacle almost inconceivable for their 1950s and '60s forbears, who seem to have come out of a less-partisan, and hence relatively more united, Christian milieu. In turn, the sexual revolution, globalization, and a burgeoning post-War middle-class, confronted America's Christian leadership with a juggernaut of issues it could hardly have foreseen, and had little idea how to effectively address. From the radical shift in sexual ethics and moral reflection brought on by the availability of contraception; to the seeming relativization of Christianity's uniqueness in light of a "global world" that seemed to draw Asia and alternative religious experiences nearer; to the slough of problems the gospel associates with wealth flooding into an upwardly mobile Baby Boomer generation; to theologians like Harvey Cox and James Pike who seemed altogether cheery about Christianity's capitulation to, and merging with, the rising secular state: all these amounted to a perfect storm for America's Christian leadership, who found themselves increasingly on the outs with the trends and direction of mainstream culture. "Progressive clergy shed their vestments on the sacristy floor, threw their incense in the trash, and sold their golden vessels to antique dealers, only to discover that somehow the puritanical young men and women who had marched with them on the picket lines had got hold of all these discards and more besides—tarot cards, Ouija boards, Tibetan prayer wheels, and temple gongs. The Latin had been eliminated from the Mass so the young could comprehend it, but they preferred instead to chant in Sanskrit. Campus chaplains had ceased trying to sell prayer and were selling social action instead, but their former constituents were hunting up Hindu gurus and undertaking systematic regimens of meditation and fasting. Some clergy lectured the Church severely about the evil of sacral liturgies which are "escapes from life," but the young increasingly preferred drug-induced euphoria and hallucinations." The fruits of accommodationism were increasingly smaller congregations, who seemed increasingly less committed to traditional Christian truths, from the theology of God, who now was to be "nearer" to me and so grow and change and learn things like me; to moral and sexual issues, which on any number of points contemporary Christians were either indifferent to or positively rejected; to recognizing any substantial need for "institutional religion" at all. On the other side was the "resistance" approach of evangelicalism and a smaller group of Catholics, who found themselves unlikely allies in an emerging "culture war" against the rising tide of secularism. The journal First Things came out of this improbable alliance (first issue, Spring 1994), as did the increasingly politically aligned pro-life movement. Though generating a significant amount of internal strength and sense of purpose, and doing what no other post-1960 Christian community seemed capable of, winning converts, weaknesses emerged almost in lock-step with the growth. A certain strain of anti-intellectualism emerged in debates over evolution and biblical inerrancy, and an often too-close-for-comfort political association with "old time Reagan republicanism" made the claims of the emerging "Christian right" less credible. Their culminating victory almost became the defining defeat. With the election of George W. Bush to the White House, a convinced and assertive evangelical had finally made his way into the Oval Office. Yet Bush's administration was hardly against using government power to effect cultural change (a supposedly forbidden practice for conservatives), and the unfolding debacle of American intervention in Iraq, whatever the original intentions, dealt repeated blows to the American Exceptionalist camp's vision for a Judeo-Christian America, and a Representatively Democratic World. "Among young people, in particular," Douthat writes, "Evangelicalism's appeal waxed among Generation X...but then waned as the Xers gave way to the Millennial Generation. A quarter of Americans under thirty identified as Evangelical in the middle 1980s, but by the election of Barack Obama in 2008, that number was below 20 percent and dropping" (138). "[T]hough the 'para' groups were immensely successful at religious mobilization, they weren't as effective at sustaining commitment across a life span or across generations. They were institutions for an anti-institutional faith...organized around personalities and causes and rarely created the sense of a comprehensive, intergenerational community that both Mainline churches and Catholicism had traditionally offered. You couldn't spend your whole life in Campus Crusade for Christ, or raise your daughter as a Promise Keeper, or count on groups like the Moral Majority or the Christian Coalition to sustain your belief system beyond the next election cycle. For that kind of staying power your needed a confessional tradition, a church, an institution capable of outlasting its charismatic founders. Instead, Evangelicalism became dominated by empire-building megachurch pastors whose ministries often burned brightly and then just as quickly burned out." One could find, I would further assert, parallel trends in the Catholic neo-conservative cluster that defined themselves against the mainstream Catholic leadership: effective in important ways at gaining adherents and martialing forces, yet ultimately with little to show in culturally-shaping influence. (4) the "City on a Hill" heresy of American Exceptionalism; it is the God of, on the right, Glenn Beck, Michael Novak, and R.J. Rushdoony, who would see America as the culmination of God's divine plan for the human race; and, on the left, of the secular messianists of the Woodrow Wilson stamp, who believe America to be the standard-bearer for all things properly good, progressive and democratic, as the Lord of Heaven rightly wills it, and wills it inevitably for the whole world. Douthat concludes with four possible options for the Christian world of contemporary America, highlighting their strengths and weaknesses: (1) the "postmodern opportunity," which exploits the cultural breakup of recent years to fashion "emerging churches" and "para-" groups that seek change society from the "ground up"; their temptation is to simply become, as Douthat puts it, "warmed over accommodationism"; (2) the "Benedict option," named after the monk and saint, which operates on the principle that Christianity must contract—if necessary into sub-cultures that retreat from the mainstream—before it grows; the danger here is to risk "paranoia, crankishness, and all the other pathologies of the religious ghetto...effectively giving up on those co-believers who aren't capable of opting out" of mainstream social engagement; (3) the "Next Christendom," which recognizes and builds on the strong emerging presence of Christianity in the "global south," reckoning within the borders of the United States with the continued influx of immigrant populations from the developing world; here Douthat makes the understandable observation that "not every form of cross-pollination is healthy," for the newly arrived representatives of Christianity from outside America's borders may import as many faults as positive and fresh emphases; and (4) to simply lower expectations as to the possibilities for Christian public and cultural influence. By any reckoning, Bad Religion is an impressive and formidable effort. It would make excellent study material for a parish group. For sheer breadth, it's one of those books that is an education in itself, drawing together statistics, names, and social and cultural trends, into a richly informative overview of the state of Christianity in the United States in 2012 anno domini. What is more, Douthat manages to articulate—as I mentioned at the outset—highly controversial and complex social, political, and ecclesial trends in a manner both accessible and balanced, giving the reader much to mull over, whatever his or her personal ideological posture. I came to agree with almost everything Douthat argues in Bad Religion. Where I disagreed it tended to be a matter of emphasis here or there, or where I wanted him to better explain some unstated assumptions (e.g. the existence of a "mere Christianity," or the concept of "heresy," apart from the Catholic Church); assumptions of which I knew he was aware, but which lay outside the purview of the book. In any case, for the Catholic, Christian, non-believer, and everything in between, Bad Religion is worth the time, and is sure to reward the interested reader with much fruit for reflection, discussion, and debate. A reflection on Feast of St. Albert the Great, Patron Saint of Scientists. A white hole is thought to be a source of light and matter that is radiating into our universe from an unknown and unapproachable source. Unlike a black hole, which pulls in unceasingly all that approaches it, a white hole is thought to have such a thrust that nothing can enter into it. This speculative model describes an event which spews out energy, light and matter, but which may be highly unstable, collapsing upon itself and then exploding. Some theorists posit a "cosmic counterpoint" to black holes, so that there would be a cosmic balancing, a supernal yin-yang of light, matter and energy. There is no firm evidence that they actually exist, but the concept of a white hole, an unceasing font of waves, vibration and spectra, makes for a marvelous model of contemplation. As created beings, we can identify the subsistence of all substances at any moment, and reflect that all created things are unceasingly supported and upheld by Being. Unlike the concept of the white hole for which we have found no positive confirmation, when it comes to the source of being, we do stand on evidence: it’s called reality. You’re touching it now. And yes, it’s really real. Adding another level of intelligibility to this vital sustaining process, we could speak of the other transcendentals such as the good and the true, as well as the related realities of beauty, communicability and love. The leap that allows one to move from the basic physical speculative model of the white hole to the awareness of the font-of-life as emanating from within us, is grounded in the principle that all creation may serve as the springboard towards contemplation. It is wisdom that allows us to order our experience and reason thus, from effects to their cause. Through creation, God ceaselessly offers endless paths for contemplating Him. Man-made artifacts show their wear and begin to age as soon as they are constructed. The table I am writing at shows its age by the exposure of the composite material underneath the varnished surface, which has been rubbed away by constant use over the years. In the brickwork opposite me, visible through the window, I see white lines of more recent mortar that has been used to fill in cracks caused by tremors, weather, shifting. From these artifacts and all others we can come to the conclusion that ‘stuff’ doesn’t last: it wears away, it deteriorates, and if it is living, it dies. Even great stellar events, such as white holes, stars, and galaxies are limited and in a state of transition but their vastness and abundance of years gives them a fabled, quasi-infinite authority. Yet beyond them, not in size and age, but in mode of being, in perfection, and in goodness, shines the source of all, who even now is in our presence and closer to us than our very self. It has been said that, “The wise man will dominate the stars.” The truth of that statement does not rest in warp drives, time travel or harnessing the energy potential of stars. It rather lies in this: that we will be lords of the stars to the extent that we are lords of our own hearts ordered to the praise of God. In the wondrous signs of creation, and the speculative thought of the sciences, we are afforded manifold opportunities to contemplate the depths and the riches and the knowledge of God. May devotion and knowledge increase hand-in-hand, as God's holy people walk through the darkness of this world into the light with joy, understanding and song. O, Font of Life and Wisdom, Holy Trinity, God beyond all praise! Amen.